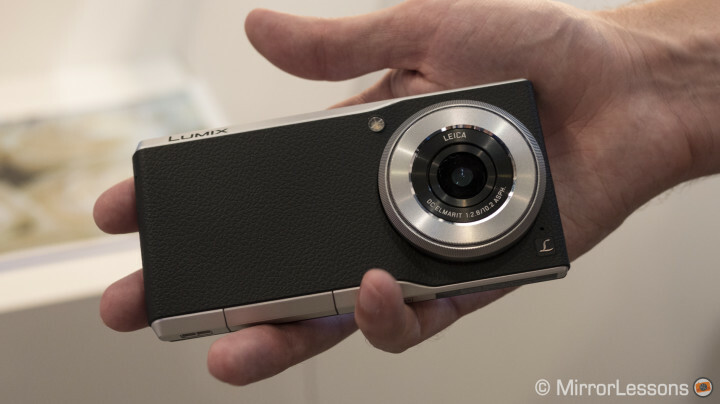 I’d already spoken in our previous news article about how much I appreciate the concept behind the Lumix CM1, a hybrid smartphone and high-end compact from Panasonic, and my opinion hasn’t changed since then. 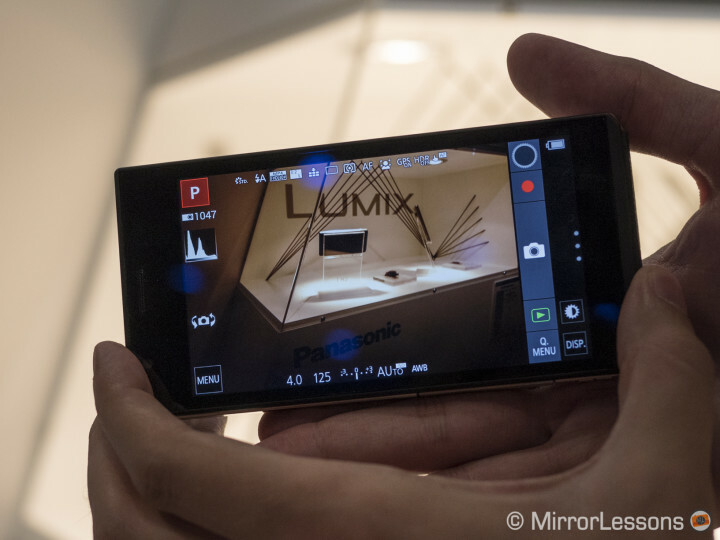 Having seen the CM1 at Photokina, we can definitely confirm that Panasonic has planted the seed of an idea that could potentially revolutionise the smartphone market as far as digital photography is concerned. 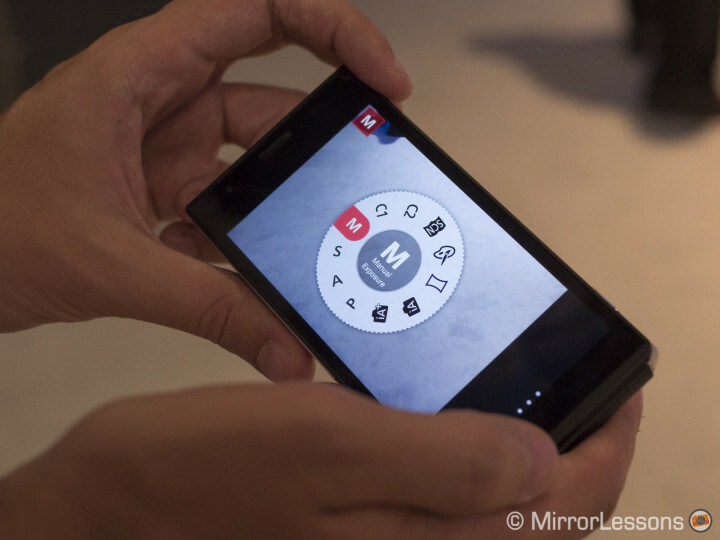 Handling the CM1, the dimensions aren’t far off your average Android smartphone. It is the thickness however that gives away its duplicate function as a camera. 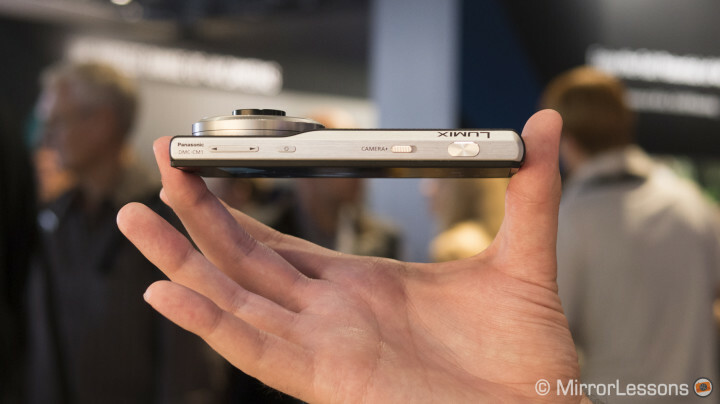 It is about two times thicker and slightly heavier than the iPhone 5, which is exacerbated by the bulk of the Leica-branded DC Elmarit 10.2mm f/2.8 ASPH (28mm equivalent). 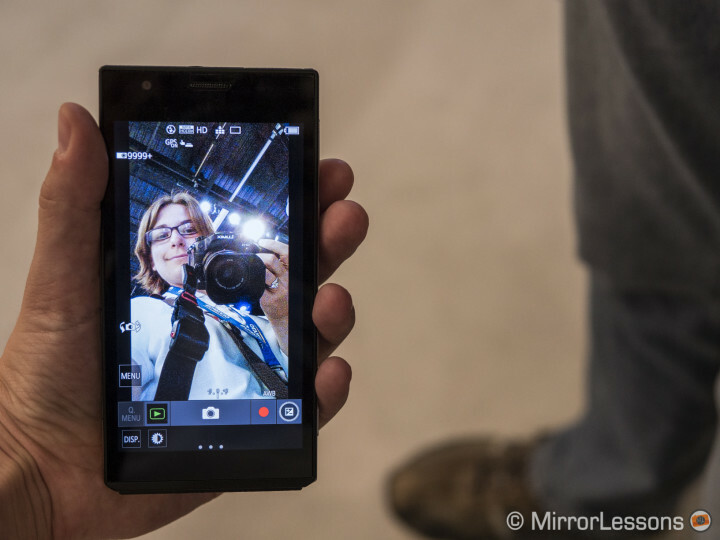 That said, it is a very compact and well-designed device overall, and still gives you the strong impression of using a smartphone, not a compact camera with smartphone functions on it. 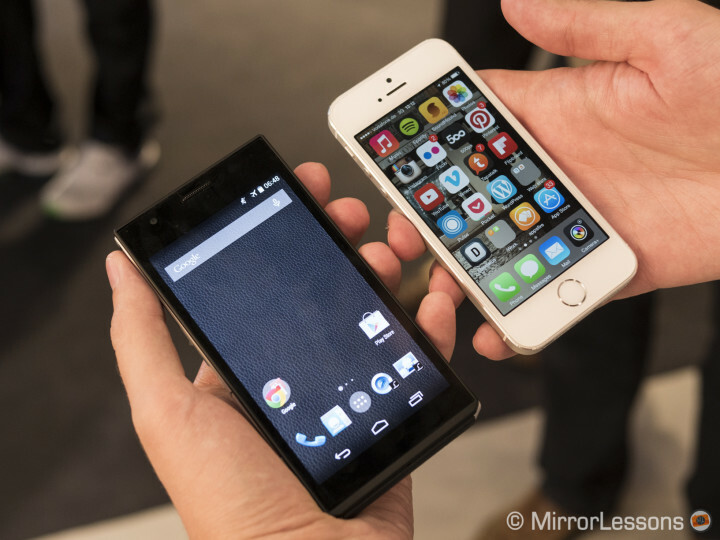 The CM1 compared to the iPhone 5. It is nearly twice as thick and heavy. 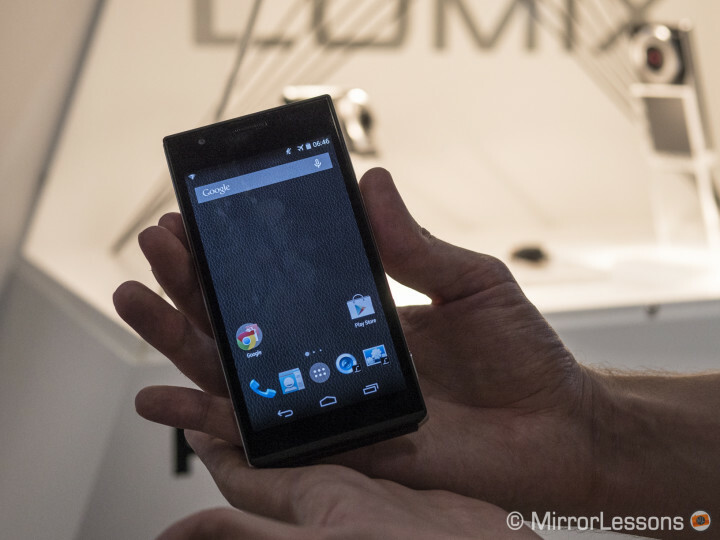 The dimensions are bigger than an iPhone but aren’t far off your average Android smartphone. Though we couldn’t take any sample images with our own memory card, we were allowed to briefly play around with the camera and phone functions. Perhaps the cleverest addition is the small sliding button on the side of the device that lets you switch between camera and phone mode in the blink of an eye. I’ll admit that I am glad they decided to create a physical button for a function as important as this, rather than force users to dig through a menu or press a button on-screen. 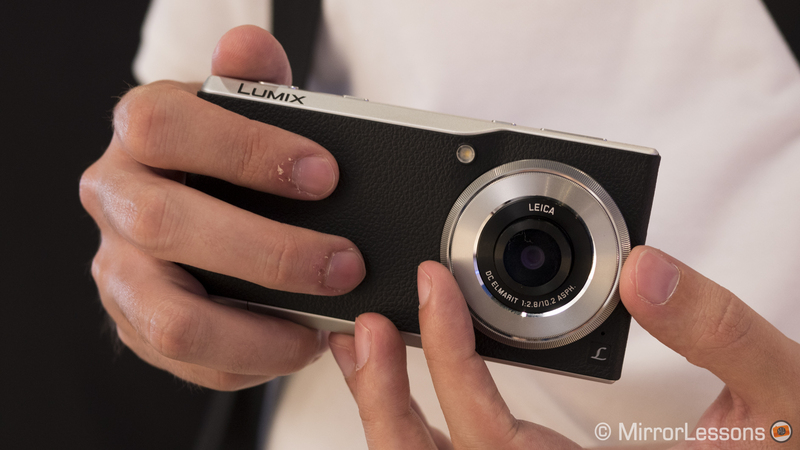 As mentioned in the news article, the device, when in camera mode, can be physically controlled just like any other camera from the Lumix line-up. There is a ring around the lens which you can use to change aperture or shutter speed, and I found it very smooth and solid, with just the right amount of resistance as you turn it. There is also a dedicated shutter button you can use to take shots. Otherwise, all shooting modes can be accessed from the touch screen, which takes on the appearance of a physical mode dial when in camera mode. You have the choice between all standard modes including program, aperture priority, shutter priority, and full manual, as well as art filters and a few scene modes. The device in camera mode. All options are easily accessible on-screen. To test the autofocus, I tried locking on to a few passersby, as well as the displays in the various windows, and it seems to work very well indeed even in poorly-lit conditions like the showroom. I can’t confirm whether it is as fast as a Lumix camera like the GM5 or LX100, but it is certainly capable of capturing the moment. I can’t comment on image quality as of yet but given its 20MP 1-inch sensor (the same as that in the Lumix FZ1000), it is bound to be miles better than the image quality any of today’s smartphones can produce. To draw a simple comparison, the iPhone 6 has a 1/3-inch sensor. Judging from the few images I took and observed on the screen, the background bokeh seems very pleasant. 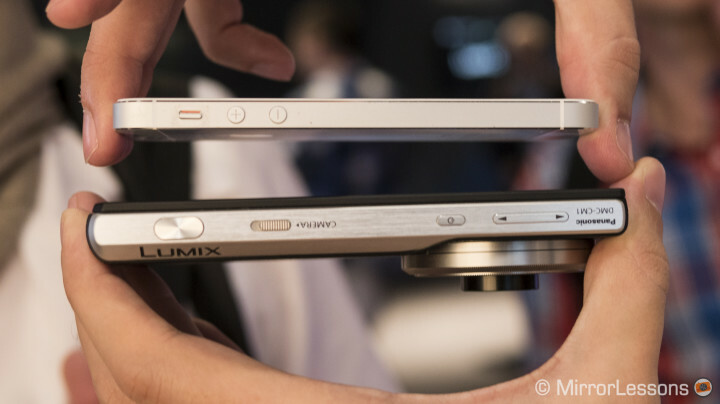 As for its smartphone characteristics, there is nothing to write home about. It features all the basics: a 1080p 469 ppi 4.7-inch screen, quad-core Qualcomm processor, LTE connectivity, and all the GHz, RAM and mAh you’ll find on a similar Android device. Some other features worth commenting on are the digital zoom (which can zoom up to 4x but will crop the image in-camera), the 4K video (15 fps only) and Full HD at 30 fps, and a LED flash. Now, while I’ve spent most of this article praising the smart camera for its innovative features and design, I have to say that there is one very large spanner in the works that could bring into question the overall practicality of the CM1, and that is battery life. 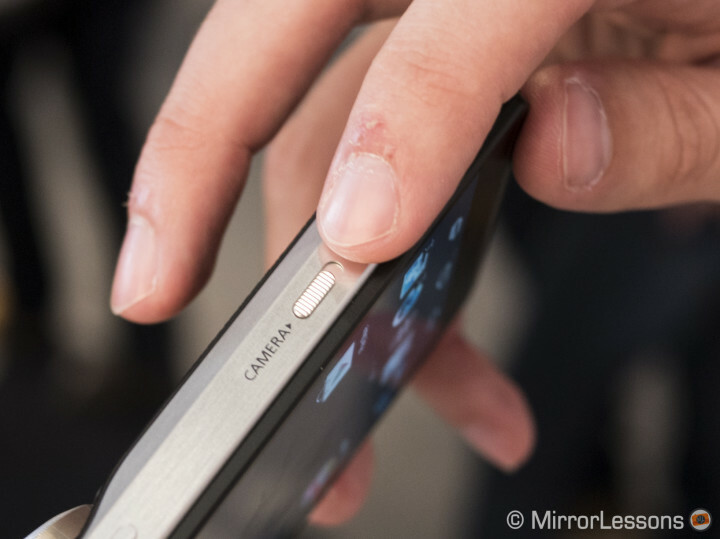 The CM1 has a 2,600mAh battery, which when used with a smartphone on its own will only just get you through the day. Combine this with a camera, and you’ll be lucky to make it through lunch if you use both intensively. Before manufacturers allow themselves to get caught up in a fury of innovation, they should really be taking the time to improve the battery life of their devices, because no one wants to be carrying around a smartphone or camera that can’t be relied upon. A second small drawback is that the device becomes quite warm after long periods of usage. Now, it is true that the sample we tried at Photokina had probably been on all day, but for someone who uses his or her smartphone frequently, the heat could become an issue. Will there be a market for this smart camera? For now, it is hard to tell. There is certainly a niche of smartphone-toting photographers who would appreciate high image quality from their phone, but these users are probably carrying around a proper digital camera anyway. What’s more, most of these 20MP high-resolution photographs will probably end up in a compressed form somewhere on Facebook or Instagram, raising the question of whether need for such high image quality is even there. I’m still keen on getting one. Looks like a trip to France is in order! Regardless of how you look at it, the CM1 is a big step forward in combining smartphone technology and digital photography. I’m sure we will all be waiting on tenterhooks to see how this new niche market develops.